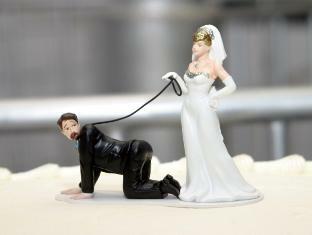 Wedding cake toppers that are funny may be your ideal choice to reflect your relationship. 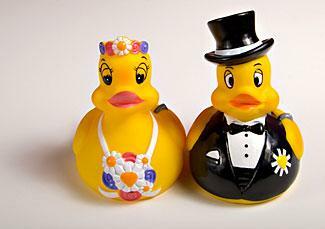 Humorous wedding cake toppers add a touch of levity to a sometimes stressful event. A plethora of fresh, original and funny cake toppers for your wedding cake include iconic characters, hobbies and the funny reluctant bride or groom. You may prefer to have your wedding cake topper created in your images. 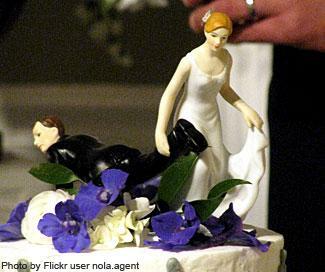 Whatever you decide, there are many great ideas for a humorous wedding cake topper. If you're looking for something unusual to top your wedding cake, consider picking a figurine that reflects a hobby or special interest that you share with your future spouse. You can find funny cake toppers for couples who love NASCAR, as well as toppers for Harley Davidson fans or a pair who loves to take ATV trips together. Choose a Disney wedding cake topper if you're planning to take your honeymoon at "The Most Magical Place on Earth." If you're having a wedding around Halloween, choose a funky skeleton cake topper. If you're the kind of couple that lives in jeans and cowboy hats, pick a Gettin' Hitched western cake topper. If you're a true animal lover, a pet theme cake topper is an excellent choice. If you opt to purchase one of these unusual wedding cake toppers, you may want to include a small note near the cake explaining your choice for guests who might not understand the significance of your decision. One of the latest trends in wedding planning is hiring an artist to craft a customized wedding cake topper in your image. Although they can be quite expensive and must be ordered several months in advance, these unusual cake toppers make lovely keepsakes to help you remember your special day. If you decide to hire an artist to create a customized wedding cake topper, remember to be as specific as possible in your requests. Include several current photos of you and your future spouse, as well as pictures of other funny wedding cake toppers made in a style that you like. If the artist has an online portfolio, use these examples as a starting point for your discussion.